Located at the cross roads into town, we offer a great location to see the cenotes, ruins, beach or to spend some time in town. We're a super-friendly 8 bedroom hotel with a beautiful garden and swimming pool. We offer free fruits and coffee and have on hand free teas, coffees and fresh drinking water. 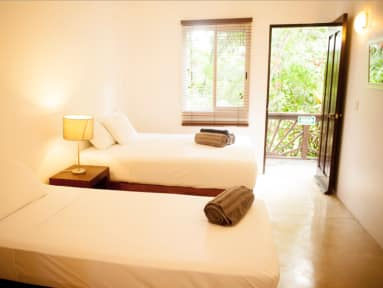 We love Tulum and the area and especially enjoy helping you see the most and get the best that the area has to offer, whether this is a day at the beach, or an inland trip to a cenote, to where has the best local food - we like to get you the best information on the area for you to get straight to the best bits. Credit Cards, Cash and Paypal Accepted! Limited luggage storage is available. there is a Supermarket across the road.